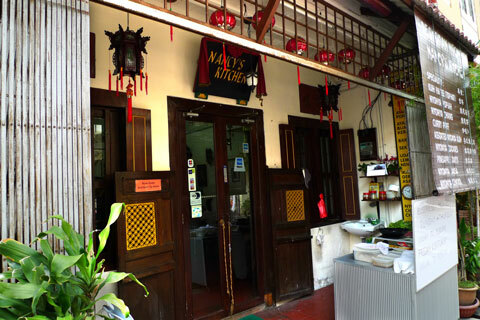 Nancy’s Kitchen is a pretty famous Peranakan restaurant that is located in one of the alleys branching out from the middle of Jonker Street. 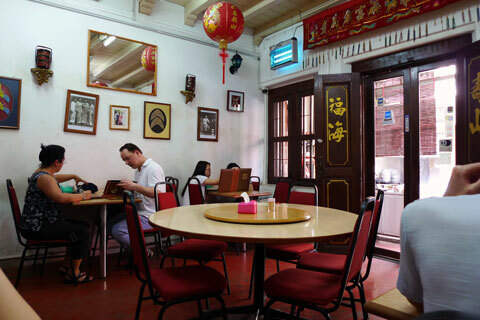 Even Singaporeans visiting Melaka know about Nancy’s Kitchen to get their Nyonya fix. 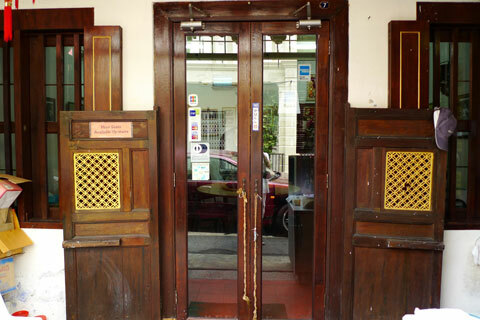 Not to be out-matched, the interior is also quite old-fashioned, like you just stepped into a restaurant from the 80s. Seating is rather limited but they do have an upstairs dining room as well. The overall atmosphere is quaint and there is a feeling of serenity, especially if you just came in from the blazing sun outside. 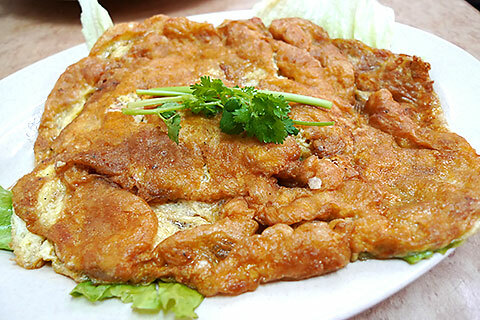 First up I ordered one of my favourite dishes, the egg fuyong! From the photo you can already tell it tastes delicious but when I tasted something extra in the egg, I realised that they must have mixed-up the order because it was actually the cincalok omelette. Nonetheless, it was very tasty with the fermented shrimp adding a subtle dimension to the omelette. This is assam babi, which is pork in tamarind sauce. 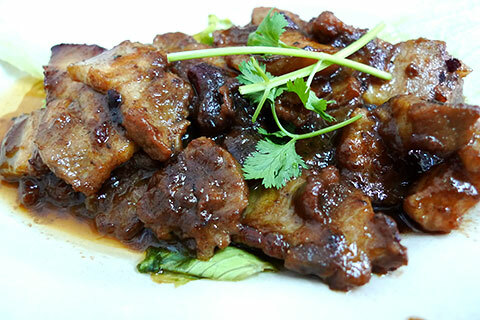 Nothing is better than biting into a crunchy piece of fatty pork but the sweet and sour tartness of the tamarind sauce really gives the dish the extra oomph! And of course my favourite Nyonya dish – bakwan kepiting! I really love this soup as I always order it at Ivins but I must say that Nancy’s version of it is really quite different, but in a good way. 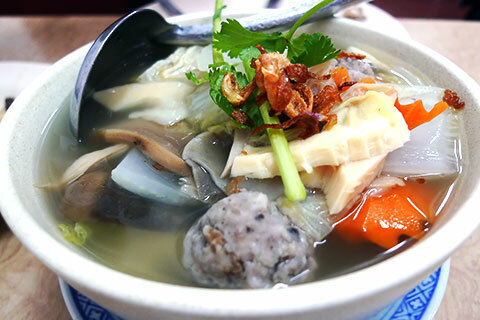 The soup is more savoury, the meatballs contain more than just meat and crab, and the bowl itself is chockful of other ingredients! There’s even an eggroll inside! Definitely a very different but tasty version of bakwan kepiting. Here’s a peek into their inner chamber, lots of Nyonya goodies packed and ready for take-away! 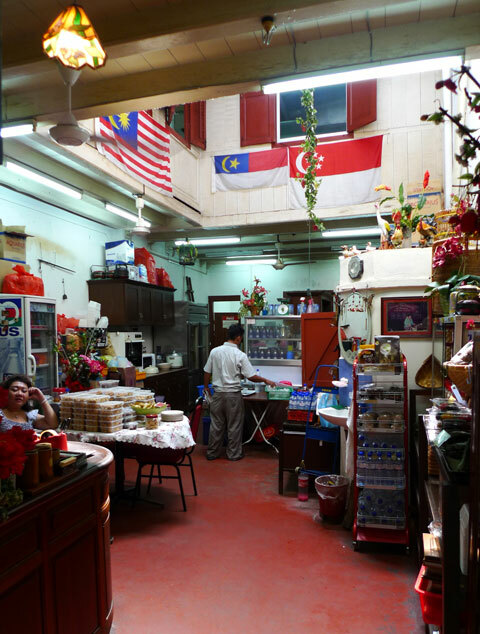 18 Responses to "[Melaka] Restoran Nancy’s Kitchen"
I hope you had got some of their kuehs. now i know the name of the restaurant! i’ve been there too, a few year ago. i had different dishes but they were delicious, all the same! Oh I think I’ve seen this Nyonya Suan in other people’s blogs also! But I always thought that Nancy’s Kitchen was one of the most famous ones. Even President Nathan ate here!! both i like but i guess i prefer the smiley lady boss at Nyonya Suan..
Hmm maybe I should try Nyonya Suan next time I’m in Melaka! Hi, love your blog on good makan places in Malacca. Just wondering if you or anyone reading this comment could point me to the famous satay stall which serves it’s satay with sauces made with thin slices of pineapple. This stall used to be the far end of Jonker Street. thinkin of goin up melaka this long weekend, you have any good suggestions? I’ve been to them in my previous trip up but didn’t blog about it. just got back from melaka and had a great time! and we found a great doughnut shop in the megamall too! It looks very interesting meals you show. I will come there to try in the future. It’s a shame to hear that about the other restaurant. I should probably update the address to reflect the move.